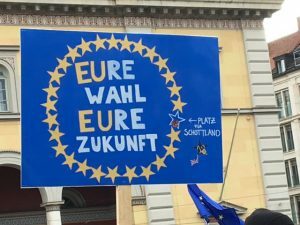 MORE than a thousand people attended a Pulse of Europe rally in Munich on Sunday, 19 March, joining thousands across Germany and other locations in Europe – including Galway, for which the crowd on Munich’s Max-Joseph-Platz gave a big cheer. 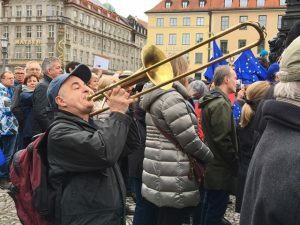 Waving flags and banners, the assembled crowd listened to speakers expounding on their personal experiences of Europe and the importance of the EU to them as private individuals, workers and professionals, community members and citizens. 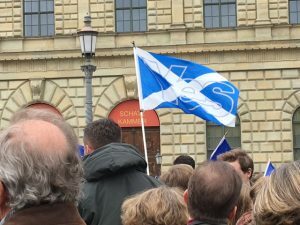 And although Britain and Scotland seem currently to be wrestling out their differences regarding union – EU and UK – membership, several of the attendees at today’s rally demonstrated their support for Scottish membership in the EU. 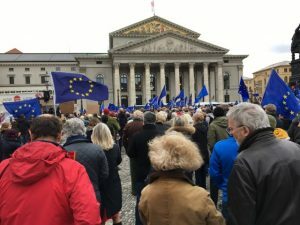 Pulse of Europe, a non-party-affiliated citizens’ initiative to defy the rise of far-right and racist politics in Europe, has begun holding rallies in German cities every Sunday. 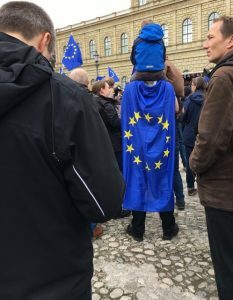 Their goal, according to the website, is “nothing less than the preservation of the confederation in order to secure peace and guarantee individual freedom, justice and legal security”. One hundred years ago, stated one speaker, European countries were at war with one another. Now, symbolised by the stars on the blue field in the EU flag, they are members of a political and economic union and – despite disagreements – at peace. The stability of the union and friendly understanding among these nations is a gift that should be valued and treasured and protected. AT THE RISK of looking like the PR for Munich’s Literaturhaus, here’s another report on an event in their programme. Apparently English writer Sarah Bakewell doesn’t often tour, but she made an exception and paid the venue an exclusive visit to promote her engaging book, At the Existentialist Café. 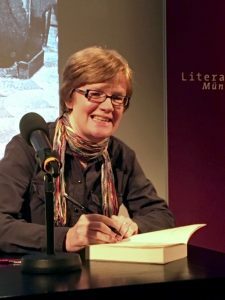 In a question-and-answer session with Austrian literary critic Sigrid Löffler, with passages from the book read by German actor and singer Wiebke Puls, Bakewell described her enduring love affair with existentialism with easy-going humour and enthusiasm. Better than straight philosophy, Bakewell’s book invites us into the cafés and jazz clubs with the existentialists, whose lives she describes with the arch affection of an intimate. Löffler describes Bakewell as the “master of presenting images in relaxed, chatty language”. Any apprehensions of a dry-as-dust scholastic treatment of a supposedly defunct philosophical movement should be dispelled by the book’s subtitle: ‘Freedom, Being and Apricot Cocktails’. The philosophers inhabiting this engaging book Jean-Paul Sartre, Simone de Beauvoir, Albert Camus and others had gained a reputation for being worthy, serious, embodiments of “stuffy old Europe” in American circles. But, argues Bakewell, these people were the rock-and-roll celebrities of mid 20th-century Paris, where they represented youth, rebellion and (sexual) freedom. Far from propounding a rarefied body of thought, distanced from the world we inhabit, the existentialists were writing about “the problems of living, of the world, of love, of desire and what it means to be a human being”, says Bakewell. Their philosophy is imbued with passion and immediacy, which is why, she says, “existentialism never goes out of fashion for 16-year-olds” – a reference to her own discovery of their dynamic work when she was a teenager. They also sometimes acted like teenagers, quarrelling and falling out with one another. But, as Bakewell explains, this is because they their ideas mattered so much to them, that they felt their ideas had the power to change the world. They lived with an admirable intensity and immediacy that we, in our technology-addicted world, no longer seem to feel. Separating ourselves from the bold fact of our physicality, the active reality of our existence, we crave easy thrills and, often virtual, distraction and disruption – nothing like the rebellion and revolt the existentialists thought, felt, advocated and put into practice.